How To Find High Authority Expired Domains FREE Full Guide! Hi, This is my first post on this blog, as i asked you all what should be in my first post, most of you asked for a guide on Finding High Authority Expired Domains Free without any tool. Note:- The Methods Used for finding domains are my own methods and never told on any site. Expired Domains are the domains which are available for instant registration on any registrar like Godaddy,NameCheap,DynaDot Etc, Suppose you bought a domain today for 1 year and when it comes to get expired you don’t renew it then it would become expired domain and anyone can register it. but why won’t you renew it? there might be some reasons like you don’t got success in running that site on the domain you bought or you don’t have enough money as well as if it got penalized then you won’t renew it so when it comes to register an expired domain we should be a lot careful so that we can be safe from getting penalized or useless domains, i’ll guide you on every thing that how to choose right domain and how to check metrics etc. It’s good question, I Always work on supposing, so let’s suppose you bought a domain on any topic or niche like Cricket and you worked on that domain nicely and ranked it awesome, then we can say this is High Authority Expired Domain, actually what does Authority Mean? it means if the domain has good backlinks DA (Domain Authority), PA (Page Authority) and TF (Trust Flow), CF (Citation Flow), and spam free, then we can say the domain is authority one. In the starting every new registered domain contain 0 Rank or Authority but as much as we work on the domain it get authority or rank and then these domains get expired that is the chance to get something free gold without mining. I am going to tell you about every single metric here line by line. DA (Domain Authority) :- DA is the Authority of domain between 1 to 100 , and it is metric of Moz (Moz is Marketing Analytics Company) DA Mainly tell us about the Authority of root domain like suppose there is a domain “Example.com” so DA will tell us the authority of that particular website between 1 to 100 , it scores via some own formulas like Backlink Qualities , Number of backlinks and etc, you can check your website DA and PA on Moz OSE Tool. You can check below in screenshot how it appears. PA (Page Authority):- Page Authority is another metric of Moz and it tell about authority of a particular page mostly, Like you have a website “Example.com/page1” DA Score will be the rank score of whole website and PA score is particular page score of that website. TF (Trust Flow): Trust Flow is a metric of Majestic and it shows the score of the quality of backlinks of your website, if your website is getting backlinks from very high authority and trustable websites then it will score up your trust flow. CF (Citation Flow):- Citation Flow is also a metric of Majestic and it shows the based on the spreadness of your website, if your website has too many backlinks in thousands of millions then your CF will be more. There should be no difference more than 10 between TF and CF , Suppose if TF is 20 of a website then CF should be 25 to 30 , not 40 or more, it indicates a spamy website. Let’s get back to the topic of Expired Domains, it was important to tell you about some metrics that has major role in finding High Authority Domains. As i’m gonna tell you my own method by which you can find high authority domains without any free or paid tool. Create An Account on ExpiredDomains.net :- Many of you may be familiar with expireddomains.net and if you are not then i’m going to make you familiar with it, so this is a website which contain updated list of expired domains, and it updates list every hour, if you want DA ,PA 50+ Domains then You are reading right post. 4. There you’ll find Backlinks Option in “Common SEO” Simply fill 12000 there. 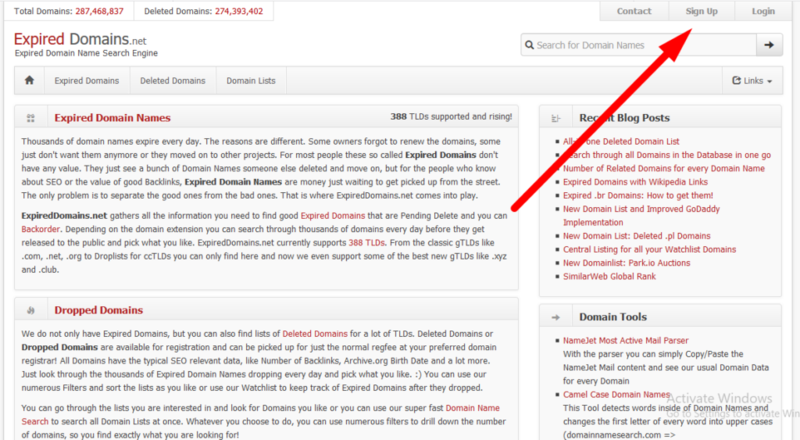 and Check on “Only Available Domains” & Domains per page “200” and click on Apply Filter, as you can below in image. Final Words:- I hope you liked my first post of this blog, i’ll post how to sale these domains etc in next post, subscribe to our newsletter and don’t forget to share this post with your friends, if you help someone , you’ll get helped by someone too.If you have any questions, don’t mind to ask below in the comments, i’ll reply to every comment. you doing excellent please share more detail. Thanks for appreciation, I’m trying my best to share knowledge. Thanks for this helpful post. I have signed up and searching for a good domain. But I am confused because I really don’t know how to use the filter properly. If you please can show us a little more about the filter usage then it will be a great help for us. I’ve explained everything in the screenshots, what other problems you are facing? tell me point by point, i’ll try to clear them. Helpful post. Waiting for your next post.